Does Your Favorite Dessert Say Something About Your Personality?.. find out what Seasons 52 thinks! Hey Tampa Bay, Alex here to let you know where you can go to figure out what dessert matches your personality. Seasons 52 has launched an online quiz that matches consumers with one of the restaurant’s trailblazing Mini Indulgences. Seasons 52, the highly acclaimed fresh grill and wine bar restaurant, pioneered the smaller-portion dessert concept back in 2003. The idea is to provide all of the pleasure of finishing your meal with a great dessert, but none of the guilt. Although these desserts may be smaller than average, they still have the same great taste! So, why not figure out what flavor best matches your personality- it will make your dessert decision easier next time you dine at Seasons 52! Seasons 52 has launched an online personality quiz that matches consumers with one of the brand’s award-winning desserts known as Mini Indulgences. Accessible from the Seasons 52 website and Facebook page, the fun quiz lets consumers find out if their personality is more like a Mocha Macchiato, Key Lime Pie or one of the other Mini Indulgence flavors, then share their results with friends via Facebook. 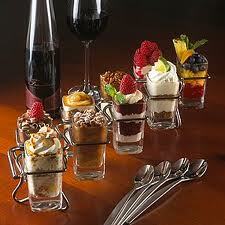 Consumers can take the Mini Indulgence quiz by visiting Seasons52.com or the Seasons 52 page on Facebook. By answering seven short questions, consumers will be matched with one of six Mini Indulgence “personalities” – from Rocky Road to Pecan Pie to Seasonal Fresh Fruit. They will also have the opportunity to win prizes through a variety of contests associated with the quiz. For more information, visit www.Seasons52.com. If you have already dined with Seasons 52, you know how amazing the Mini Indulgence’s are! If not, make sure you head over there as soon as you get the chance to try one of their fabulous desserts- Rocky Road, Pecan Pie and Chocolate Peanut Butter Mousse, the Mini Indulgence lineup also features seasonal favorites such as Pumpkin Pie with a ginger snap crust in the fall and Strawberry Shortcake in the spring. Check back often for more Tampa Bay dining information and things to do in Tampa Bay!